High-quality early learning gives children a strong start on the path to college and career. That’s why The Children's Trust has been raising the bar of early childhood education, more commonly known as child care, through its countywide Quality Counts initiative that is now sunsetting to make way for an even more innovative approach. Our new early learning quality improvement system will be the heart of a more comprehensive funding strategy called Thrive by 5. We are refining our strategic investments in the early childhood arena based a growing body of research, proven strategies, and the realities of our child care market. Our new quality improvement system will be more flexible and tailored to address the financial challenges of child care providers in low income/high need neighborhoods, resulting in higher quality programming and equitable access in all neighborhoods. 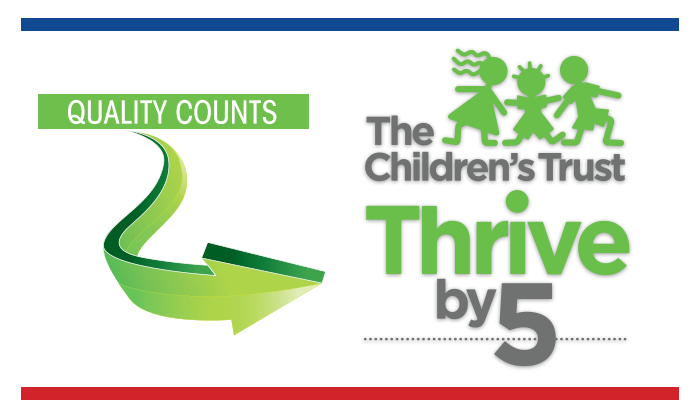 Look for more information about our Thrive by 5 initiative in the coming weeks.